This is a great recipe for an easy Sunday lunch — all you need is a really big pan or pot to to fit the whole chicken, veggies and extras. 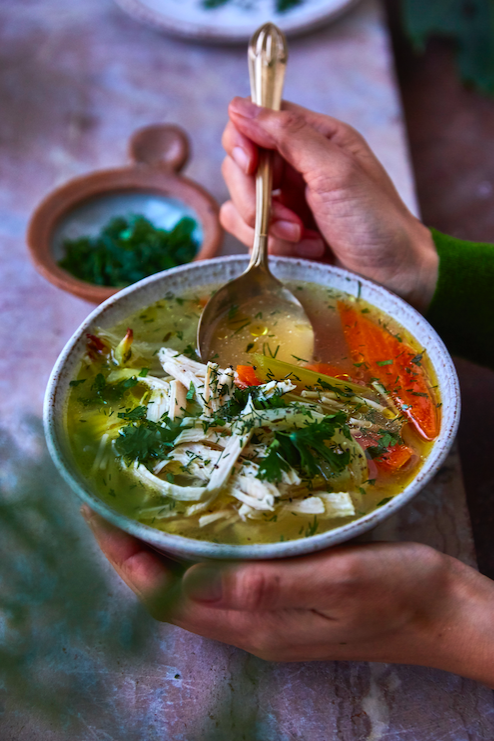 The recipe is inspired by the ‘Jewish penicillin’ way of making this classic feel-better soup, complete with dill, dumplings and noodles. Rather than matzo crackers, I’m using gram our to make my ‘matzo balls’ — lovely egg and gram our dumplings that bob about in the soup. If you have any digestive problems, it is best to eat the chicken and the dumplings at separate meals. Unless I’m entertaining and want to serve the complete works, I usually make the chicken soup and enjoy the chicken and vegetables, then pop the carcass into my slowcooker for 24 hours, adding a fresh batch of vegetables and aromatics halfway through to make a second batch of chicken soup cooked with dumplings — it makes for a week of delicious food. If you love these dumplings, enjoy them with Wahay Soup (see page 202 of East by West). Rinse the chicken and place in a very large saucepan. Cover with water until it reaches at least 8cm (3in) above the surface of the chicken. Bring to the boil, then turn the heat down and simmer for 30 minutes. Skim off any froth that comes to the surface. Add the rest of the soup ingredients (apart fromthe parsley, dill and noodles, if using) and bring everything back to the boil, then turn down the heat and leave to simmer for 1 hour. If you want to make your gram dumplings with chicken fat, then reserve 11⁄2 tablespoons of the fat by skimming the surface regularly into a bowl — the fat will start to solidify at the top as it cools. Meanwhile, to make your gram dumplings, whisk together the gram our and baking powder in a bowl. Beat the eggs in a large bowl with the olive oil or ghee (or your reserved cooked chicken fat), dill and the salt and pepper. Slowly stir in your gram our until well blended to make a thick, sticky batter. Leave in the fridge for 30 minutes, covered with cling lm, then wet your hands with cold water and roll the dough into about twelve small balls (roughly 1 teaspoonful each) — or make them slightly bigger, if you like. Don’t roll them too large, though, because they double in size when cooked! Carefully remove the chicken to a large dish and leave to cool slightly. Using two forks, shred the chicken from the bones and set aside, reserving the skin and bones to make another stock (see page 261). Bring the soup back to the boil and gently drop in the dumplings. When they rise to the surface, turn the heat down to a simmer and cover the pan. Cook for 20—25 minutes, until the dumplings are cooked through and the centres are light. Cut one open to check — if the centre is hard and dark, cook for another 3—5 minutes, until cooked through. About halfway through the dumpling cooking time, add in the noodles, if using, to the pan and cook gently for the nal 10 minutes. Add all your shredded chicken meat to the soup, along with the parsley, and warm through for3 minutes. Season with salt and pepper, sprinkle with the dill and serve. If you find it hard to shape your dumplings, then chilling the batter for about 3 hours will help. Don’t worry if you can’t get the hang of shaping them, though, as you can simply use teaspoonfuls of the mixture — they might not be the perfect shape but will be lovely and rustic.